We are preparing for the 2018 Spring Open House here at KLZR. As part of the Open House, we change the Spirit of The Valley art exhibit featuring local artists. If you would like to participate in this exhibit we would love to hear from you … photographs, hangable art, sculpture … all are welcome. Please contact Paul Leach paul.leach.co@gmail.com or 783-9750. We look forward to seeing you Saturday, May 26. 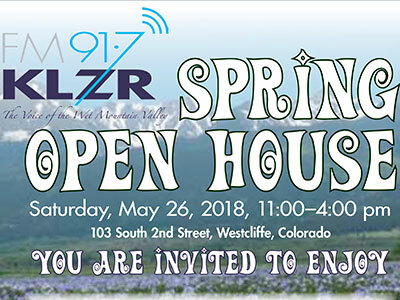 Meet KLZR folks, learn about upcoming KLZR events, enjoy lots of goodies and enjoy the music from favorite valley performers as well as others performing here for the first time. Check out the KLZR Photo Gallery!